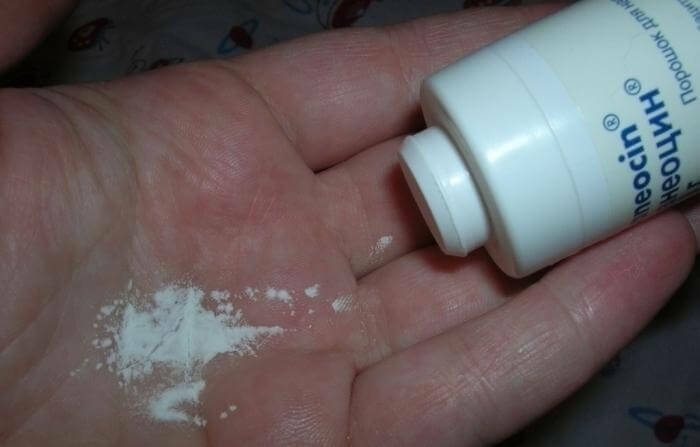 Full analogs in the form of powder does not exist. These drugs are not complete structural analogues, consult your doctor. 330 р. 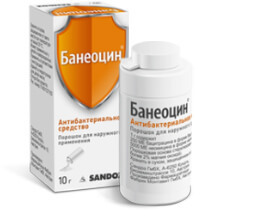 Average price online * 330 r.
Baneocin in the form of a powder is a combined antibiotic for external use of a wide spectrum of action, which has no analogues, is not addictive, and is used to treat both adults and children of almost any age. healing of burns, abrasions, wounds and cracks in the skin. It is applied exclusively outwardly. To do this, use a dosing cap and a thin layer to distribute the powder over the damaged or infected skin. Putting a bandage on top is not necessary. The frequency of the procedure is on average 2-4 times a day. With an extensive wound surface, occupying more than 20% of the body, the drug can be used only once a day. To care for the navel of newborns, you must first treat the wound with hydrogen peroxide, dry it with a clean cotton swab, and then sprinkle it on top with Baneocin. Up to 5 procedures can be performed daily. The duration of treatment of the umbilical wound is usually from 2 to 5 days and should not exceed a week. The maximum dose for an adult patient with an extensive wound surface is approximately 200 g of powder (20 cans of 10 g each). 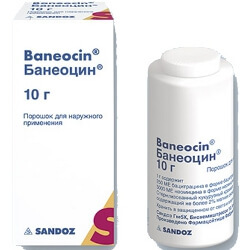 If it is necessary to repeat the weekly course of treatment with Baneocin, the maximum possible therapeutic dose is reduced to 100 g (10 cans of 10 g each). The therapeutic effect of Baneocin is not reduced if the drug is mixed with blood or other body fluids. if the patient suffers from a severe form of renal or heart failure with a pronounced impairment of urination, as in this case, Baneocin, when absorbed into the blood, may have a toxic effect on the kidneys. Special studies on the effect of Baneocin on the body of a pregnant woman and fetal development have not been conducted. A future mother or nursing woman is advised to consult a doctor before using the drug, because if it enters the blood, the active ingredients of the drug penetrate into breast milk and overcome the placental barrier and theoretically can harm the baby or fetus. temporary paralysis due to impaired conduction of neuromuscular conduction. When applied externally, the drug acts exclusively on the skin surface and is practically not absorbed inside, even in the presence of wound and bleeding surfaces. 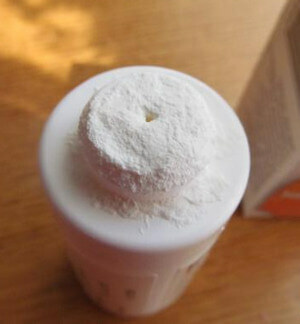 In the pharmacy, Baneocin can be purchased as a powder without a prescription. Store it in a dry and dark place at room temperature. Shelf life is 2 years.